Chauvin Gardens is a family operated greenhouse. Our venture in greenhousing started back in 1972 when at this time Ken entered the field of mechanical engineering consulting and spent 13 years as a horticultural design engineer and consultant. 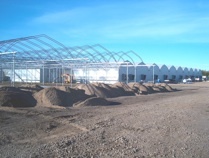 During this period notable projects included mechanical design of the Lethbridge Research Station for Canada Agricultural, Plant Science Extension programs for Fairview and Olds Colleges, and various other private grower blocks and Provincial Research Greenhouses. In 1986 our parent company Agroponic Industries Ltd. was created. 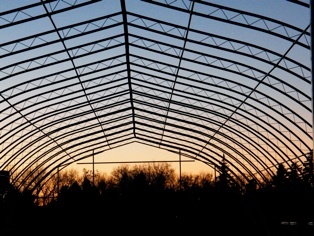 From this date to present, Agroponic Industries Ltd. has spent the last 28 years actively constructing, maintaining and upgrading commercial greenhouse structures and systems throughout Western Canada. 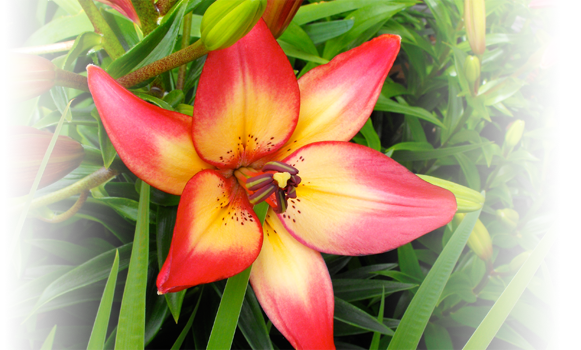 We have been actively involved the design, construction and ongoing maintenance in cut flower ranges, tomato/cucumber and pepper ranges, tree seedling and silver culture ranges and bedding plant production and retail centres. 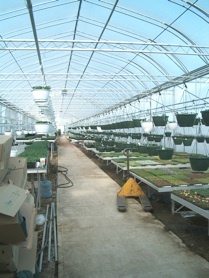 In the fall of 2008 construction was started on our greenhouses. 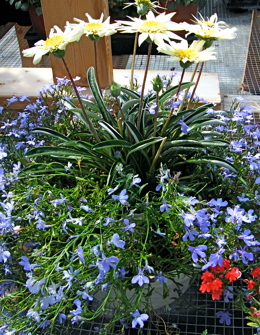 Since this time Chauvin Gardens has become a major bedding plant and garden center for residences and businesses the the local and surrounding area. 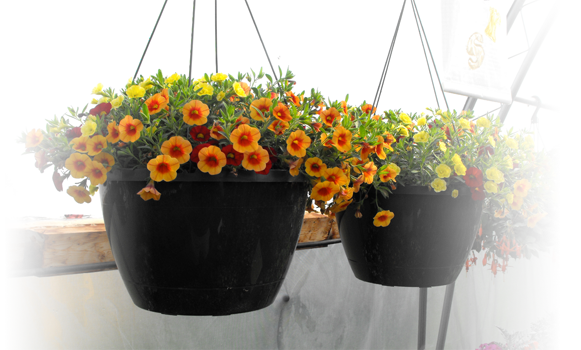 Chauvin Gardens is an active member in AGGA ( Alberta Greenhouse Growers Association ). 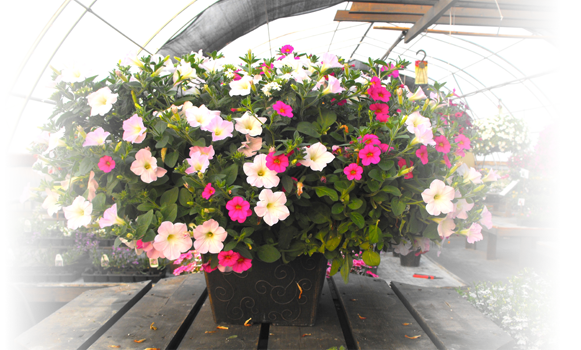 We take great pride in growing and raising the highest quality plants, seedlings and transplant vegetables. 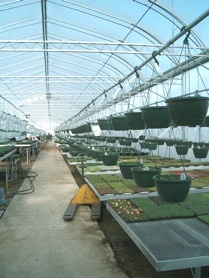 Late in 2008, after land was assembled in the village of Chauvin, construction of our greenhouses started. During this period all members of the family helped building up the project. Green design and operational principles were utilized from the start. Phase one is comprised of a reinforced freestanding greenhouse structure that includes many interesting design and construction features that really makes our business very eco and friendly. Phase one is our display/retail garden area. This was open for a very successful first year of operation in 2009. 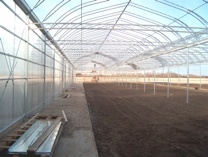 Phase two is comprised of an additional 30’ X 144’ freestanding greenhouse structure. Cladding was completed late in 2009. This structure will be our growing and service building. It will allow us to hold sold items including containers put together by customers in our potting classes, and space for propagation of seedling transplants, etc. It is planned to use this structure for the production of several select vegetable crops for the market garden operation. 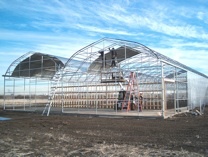 This structure is again very unique in terms of conventional greenhouse structures. It is clad with reinforced poly cladding and features a roll up roof for cooling. Eco friendly …. green design / construction methods – you bet ! Our greenhouses are completely off the utility grids. We generate our power requirements from both solar and wind sources. Rainwater from the roof is directed to side wall hip water storage tanks which are capable of holding 22,500 gallons of water. These tanks absorb heat during the day and release it at night. Solar collectors and a battery power system are used for power needed to run the building. In 2010 a windmill was added to our off the grid system. Our passive cooling system comprised of roll up side walls and high level vents. In the fall of 2009, phase two was started. Phase two is our production and greenhouse vegetable house. 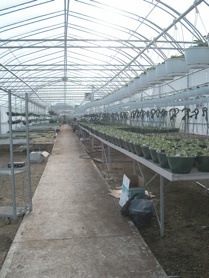 In this house we start all our bedding plant crops, vegetable transplant seedlings, baskets and containers. Around the beginning of June we start our watermelon, honeydew crop and tomatoes. These crops love heat and the greenhouse provides all that they need. This structure is quite unique in Alberta. It features a retractable reinforced roof system which will provide excellent passive cooling and ventilation. Again all rain water is directed to sidewall hip storage tanks and is completely off the power gird. The heating system is comprised of a very high efficiency low temperature hot water boiler system with under the bench heating. In 2011, phase three was started. Phase three included our outdoor U-pick area which features various varieties of strawberries, varieties of raspberries which offer both mid summer and early to late fall production, three varieties of cherries, hascaps and saskatoons. In addition we started development of our court yard between our two greenhouses to display and overwinter our selections of zone hardy perennials and trees and shrubs. We always get asked about our parent company Agroponics … what the heck do they do? Well a few pictures are worth a 1000 words. 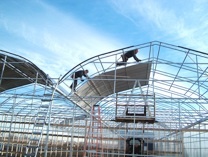 We build and construct commercial greenhouse projects. Some of our clients are 1, 5, 10 to 15 acres in size. 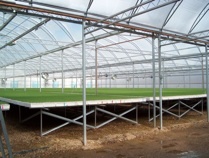 In addition to just the greenhouse structures they install boiler systems, heating systems, cooling systems, fog systems, fertilizer injection systems, photo lights, watering booms, and computerized environmental controls. 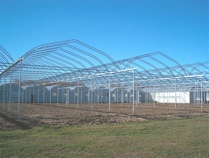 Agroponic Industries specializes in complete turn key greenhouse projects.